Chief Petty Officer Terrell Horne III, 34, of Redondo Beach was pronounced dead Sunday after he was brought ashore. 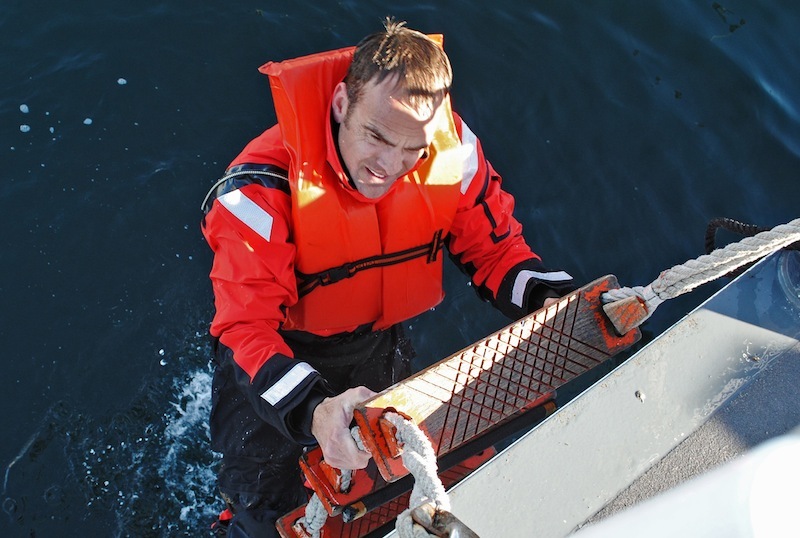 LOS ANGELES — The killing of a U.S. Coast Guardsman whose crew was chasing a vessel suspected of being laden with drugs appears to be the latest example of how smugglers are venturing farther north in a game of cat-and-mouse along the California coast. Chief Petty Officer Terrell Horne, 34, died Sunday after he was struck in the head by the suspect vessel near the Channel Islands, west of Los Angeles and about 180 miles northwest of the U.S.-Mexico border. 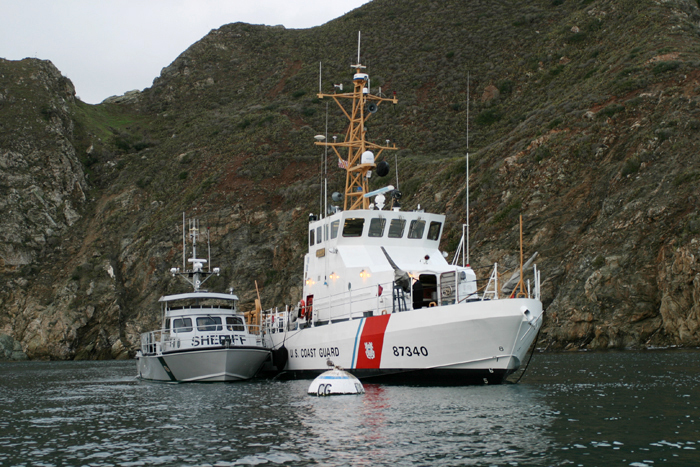 The Coast Guard cutter Halibut conducts a mission with California authorities in this file photo provided by the U.S. Coast Guard. Two Mexican men — Jose Meija Leyva and Manuel Beltran Higuera — were charged Monday in Los Angeles with killing a federal officer while the officer was on duty. Horne is the first law enforcement official to die on California’s seas since a spike in illegal activity began several years ago, said Ralph DeSio, a U.S. Customs and Border Protection spokesman. At least six people aboard suspected smuggling vessels have been killed since the 2010 fiscal year. The Halibut, an 87-foot patrol cutter based in Marina del Rey, was dispatched after a Coast Guard C-130 plane spotted the 30-foot “panga” vessel was spotted traveling without lights near Santa Cruz Island, the largest of the eight Channel Islands, according to a criminal complaint. The cutter contains a 21-foot-long rigid-hull inflatable boat that the Coast Guard routinely uses on missions that require more speed and agility than the cutter can deliver. As Horne and his team came within about 20 yards of the suspect vessel in their inflatable boat, the suspect vessel gunned its engine, knocking Horne and Brandon Langdon into the water, according to the complaint. Langdon was treated for a knee injury and two other crew members aboard the inflatable boat were unharmed in the collision at 1:20 a.m.
Coast Guard spokesman Adam Eggers said waiting for the vessel to make land would have introduced other risks and logistical challenges. The Coast Guard’s mandate, he said, is to interdict at sea. “As of right now, there are absolutely zero questions about whether they followed proper protocol,” Eggers said. Coast Guard crews followed the suspects by air and sea for nearly four hours until the vessel’s engine died 20 miles north of the Mexican border, according to the complaint. An officer used pepper spray on both suspects. Meija Leyva identified himself as the captain and told authorities he was taking gasoline to lost friends, according to the complaint. Beltran Higuera told authorities he was offered $3,000 to deliver gasoline to another boat that was waiting for them, but they never found it. The complaint makes no mention of drugs being found on the boat. Attorneys for both men did not immediately respond to phone messages seeking comment. A judge scheduled a preliminary hearing Dec. 17. In growing numbers, smugglers are turning to California seas to bring people and drugs to the United States from Mexico. The number of Border Patrol agents on land has doubled in the past eight years and hundreds of miles of fences and other barriers have been erected, driving smugglers to the Pacific Ocean. U.S. authorities spotted 210 suspected smuggling vessels on California shores during the fiscal year that ended Sept. 30, up 15 percent from 183 incidents the previous year and more than quadruple the 45 incidents in 2008. More than half the sightings are still in San Diego County, bordering Mexico, but boats are turning up as far north as San Luis Obispo County on California’s central coast. According to U.S. Immigration and Customs Enforcement, there were 14 incidents in Los Angeles County last year, seven in Ventura County and 11 in Santa Barbara County. In one typical case in October, a Mexican woman told authorities she agreed to pay $12,000. A criminal complaint says she was among 16 people — all but one a suspected illegal immigrant from Mexico — found in a 31-foot vessel that appeared to be taking water in the Newport Beach harbor. In September, authorities seized 3,475 pounds of marijuana from a boat that landed near Hearst Castle on the central coast. The Halibut’s commanding officer, Lt. Stewart Sibert, said Monday he and his crew were devastated by the loss of Horne, calling the Redondo Beach man the best shipmate he ever knew. Just a few months ago, Horne helped save the lives of three people on a sailboat that was struggling against darkness and howling winds near the Channel Islands. “Our fallen shipmate stood the watch on the front lines protecting our nation, and we are all indebted to him for his service and sacrifice,” said Admiral Robert J. Papp, Coast Guard commandant.